Joe Bourne's Brain Dump Blog! : GSXR Has Gone Mouldy! Yes thats right, my GSX-R 600 K7 has started to go mouldy!! 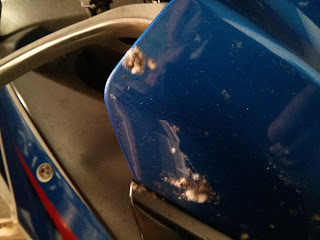 I was in the garage at the weekend looking over my new KTM300 and noticed that my Gixxer that i havent ridden for a while has started to grow mould on the front fairing. It looks like whatever flying creature i last splatted across the fairing its taking its revenge by decaying and breading mould. Sure sign that we need to get some good weather so that i can take the Gixxer out for a well deserved thrashing to blow away the cobwebs and clean off the mould! !